Bold eyebrows are one of the enduring beauty trends of the past few years. It’s been a good 5years since the look began to gain popularity with models and celebrities (it made Cara) and eventually with us average joes/general public too with the introduction of HD Brows etc. It’s still very much a thing. And I doubt it will be going anywhere soon. For once having bushy eyebrows in your genes isn’t a bad thing. The trend has lead to new & innovative products by all the leading cosmetics companies. Nowadays all you need is a good brow. This little beauty has brow gel & highlighter all-in-one! I just love how quick and easy it is to use also. You can read my full review on it here. 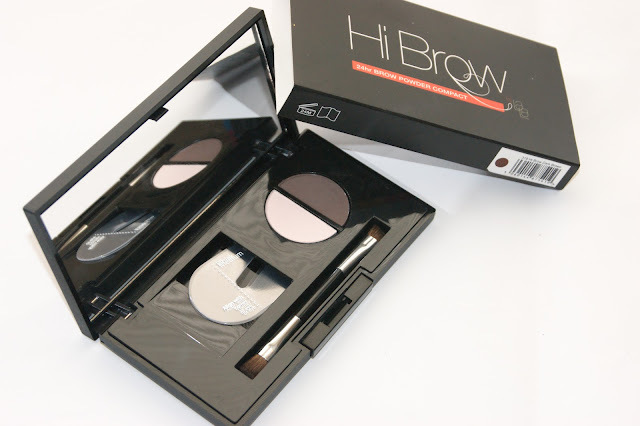 Hi-Brow by LaLa is a small but perfectly formed kit that contains two powder segments -one colour to fill the brows and the other is a pale milky pink that is iridescent to highlight. The kit also contains a duo ended brush which is a nice extra but the best part is the small almost hidden compartment that contains 3 brow stencils! The compact also features a large mirror so you can fill and fix your brows on the go. This product requires some time, effort and precision. But a big selling point is that it comes with tweezers, two brushes (one angled, one not), a pigmented wax for shaping and a natural-shaded powder for setting. This products comes in two different shades and has the added benefit of being all natural. The formulation is sugar-based rather than chemical filled, which is always good. A great long wearing gel that will fill, and keep all fly-aways & strays in place. It’s waterproof so it really does stay put. I hope you have the perfect brows this summer If you would like a ‘how to’ please don’t hesitate to request it.